Nothing is worse than not being prepared for a blackout when power cannot be restored for days on end. Natural disasters can cripple families who do not have a backup power source to power needed appliances such as air conditioners, furnaces, and refrigerators. This is where a generator that is made for a whole house emergency backup comes into play. Depending on the size of your home and which appliances you will need to power, the generator size that you will need will vary. We are going to look at some of the best generators in the 5,000-35,000 watt range to give you a good idea of what to expect. Ensuring that you are prepared for your next blackout will require you to do some thinking of what you will want to keep running until your power is restored. If you are just needing a few essentials, then the Westinghouse WGen 5500 can help get you through. This generator puts out 5500 running watts and 6875 starting watts for an impressive 14 hours at 50% load. This kind of wattage ratings will allow you to keep essential appliances running such as a refrigerator to keep your food cold, a heater in the case of a winter storm, and a fan if the blackout is in the summer. At only 170lbs, you can easily move this generator to any area that you desire with the built in collapsible handles and never flat wheels. This allows you to easily wheel it out of your shed or garage and get it powered up quickly to get your entire house appliances running again. It includes 4 household style outlets and a L14-30R outlet to let you power up just about any type of appliance you may need in and around your home. These outlets are also covered to protect them against any foreign objects. For those wanting a more permanent solution, this generator is transfer switch ready, making it the perfect all in one portable generator that can also be used as a home backup power source. This generator is also EPA, CARB, and CSA compliant. Westinghouse offers a 3 year warranty on their Wgen5500 5,500 Watt Generator. IMHO: In My Humble Opinion Verdict: As the lowest power rating on the list, this generator is a great tool to have around when you need to keep a few appliances up and running to get your through a blackout. With 5,500 running watts, you can easily power a refrigerator, fans, and heaters to ride out the power outage. 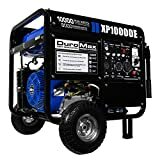 For those who are more attracted to the idea of having a more universal generator that can be used for both home emergency backup power and still be used in other places such as camping or tailgating, the Duromax 8,000 watt portable generator should be on your list of generators to check out. Featuring collapsible handles and inflated wheels, you can easily move this generator around to wherever you may need it and break it out when there is a power outage in your home. This generator puts out 8000 running watts and 10000 starting watts for up to 10 hours at 50% power which is the perfect amount to keep many of your larger appliances running throughout your blackout. The Duromax XP10000E features a variety of different outlets including 2 household outlets, 1 120V 30A twist lock AC outlet, 1 120/240V 30 Amp, and 1 120/240V 50 Amp. This variety allows you to plug in just about any type of appliance you can imagine and can even power up an RV if you needed it to. A powered electric start allows for this generator to be started and operated by just about anyone making it a great fit for those who cannot operate a recoil start generator. It does come equipped with a recoil start as a backup to the electric start. Duromax offers a 3 year warranty for the original purchaser of a Duromax generator. IMHO: In My Humble Opinion If you are needing to power just the essential appliances in your home, this 8,000 watt generator will be a perfect fit for you. With easy to use convenience features such as collapsible handles and wheels, you can easily move this generator to where you need it quickly during your next blackout. 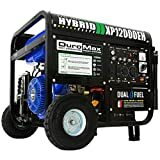 As the only dual fuel generator on this list (click here for more), the Duromax XP12000EH has a great advantage for those who are wanting a hybrid generator. What this means is that unlike many generators that are powered only by gasoline, the XP1200EB generator can be powered by gasoline and propane for added convenience and longer run times. A propane adapter hose is included to hook up a standard 20lb propane tank to the generator. This is essential when a prolonged blackout causes fuel shortages. By providing 9500 running watts and 12000 starting watts, the Duromax XP12000EH generator can power all of your essential home appliances to keep you and your family comfortable during a blackout. With up to 20 hours of run time, you can easily make it through the day without having to worry about refueling. Not only is it a great home backup power source, the collapsible handles and rubber tires allow for it to easily be transported to be used around the home and away from home if needed. This generator is a very versatile generator that can be your all in one solution for many problems. This Duromax generator has a 30 day replacement warranty and a full 1 year parts warranty. IMHO: In My Humble Opinion When choosing a generator for your home emergency backup source, you will want to consider the fuel possibilities as some emergency situations may leave you without access to gasoline. This hybrid generator is a consumer favorite for the fact that it can be ran on propane and gasoline for the ultimate versatile generator. 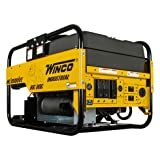 Stepping out of the popular brands on this list, the Winco WL18000VE generator is definitely worth mentioning for your backup power house emergency needs. Featuring a Briggs & Stratton Vanguard engine, the Winco WL18000VE puts out 18,000 starting watts and 15,000 running watts. This power level is considered to be enough to power most of the appliances in many small to midsize homes. It has a run time of about 14 hours at 50% load which makes it a great candidate for powering your home throughout the night or even all day without having to refuel. You can plug in just about any appliance imaginable with its many different power outlet receptacles. These include 4 120V household outlets, 1 240V 30 amp outlet, and 1 120V/240V 60 amp outlet. The only thing that we did not like about this generator is that it is a portable generator without the convenience of collapsible handles or wheels. At 442 lbs, it is going to either need to be mounted in a semi-permanent location, or you will have to have a way to move it around your home. One of the biggest advantages however, is that Winco load tests each one of their generators before it leaves their facility to guarantee a fully functional generator is arriving to you. This is rarely seen with other manufacturers and could mean the difference when buying your generator is time-sensitive. Winco offers a 2 year limited warranty on their WL18000VE 18,000 watt generator. IMHO: In My Humble Opinion As the last portable generator on our list, the Winco WL18000VE generator is a great generator to have as an emergency backup. However, we would have really like to have seen better transporting options as this generator is very heavy and does not have any wheels to easily move it around. If you are looking for a more permanent solution for your power outage needs, a standby generator maybe worth looking into. A standby generator is a generator that is permanently affixed outside your home and hooked up to your power system by a professional to allow for easy transfer of power from your main source to the generator in the event of a blackout. The first standby generator on our list is the Briggs and Stratton 040396 20,000 watt generator. This generator provides reliable backup power to your home in the event of a power outage. With 20,000 watts, you can supply enough power to keep your small to midsize home appliances running without incident. For larger homes, you can power most of your larger appliances that you will need to get through your outage. This generator is automatically air cooled to ensure that it stays within reasonable temperatures and does not overheat. 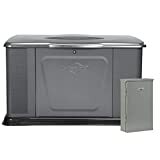 It includes a 400 amp, dual 200 amp transfer switch for an all in one kit to be installed by a professional. Briggs & Stratton offers a 5 year limited warranty on their 040396 20,000 watt generator. 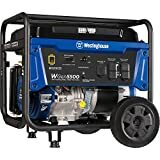 IMHO: In My Humble Opinion This 20,000 watt generator is a perfect addition to any household that is wanting to keep their main appliance running during a blackout. The dual 200 amp transfer switch makes this generator a very attractive kit to have installed quickly and easily. The Briggs and Stratton 040395 20,000 watt generator is going to be a direct replica of the 040396 above, however, it will features a 100 amp, 16 circuit transfer switch. This kit will be for those who want a different transfer switch or are required to have a specific type of transfer switch per local regulations. All of the features of this kit will be the same as the 040396 including the 20,000 watts, 500 lb weight, 68 dba noise level and 120 volt, 240 volt capabilities. Briggs & Stratton offers a 5 year limited warranty on their 040395 20,000 watt generator. Just like the 200amp switch version, no major cons to mention. IMHO: In My Humble Opinion For those wanting to power multiple large appliances in their homes this Briggs & Stratton air cooled standby generator is a solid choice providing you with an addition 100 amp 16 circuit transfer switch. This all in one kit is ready to be installed by a licensed professional to keep you and your family protected during a power outage. One of the most iconic names in the generator industry is Generac and they are back on my list with the 7043 22,000 watt generator. This generator is another permanently affixed whole house generator that is perfect for those who experience multiple blackouts a year or who cannot go without power for more than an hour. 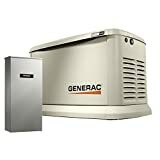 The Generac 7043 powers up to 22,000 watts and is a perfect fit for standby emergency power. This air-cooled standby generator includes Wi-Fi and a Whole House 200 Amp NEMA3 transfer switch to make for the perfect, ready to install kit. This means you do not have to shop around for a compatible transfer switch with this generator. This generator is a single phase generator with True Power technology that delivers best in class power quality. Generac offers a 5 year limited warranty on their 7043 22,000 watt generator. IMHO: In My Humble Opinion If you are looking for a powerful generator with Wifi capabilities, then the Generac 7043 is for you. This generator comes equipped with built in wifi and a 200 amp transfer switch for easy convenience. If you are needing just a little more power than the 22,000 watt generator, the Generac RG02515JNAX generator can fulfill those needs by providing you with 25,000 watts of continuous power. At 843 lbs, this generator is going to be a permanently affixed generator that will require a crane for delivery. The construction of this generator ensures that it is fully protected with an aluminum enclosure and a liquid cooled feature to ensure that your generator never overheats. This generator is a three phase generator with True Power technology that delivers best in class power quality. Generac offers a 5 year limited warranty on their RG02515JNAX 25,000 watt generator. IMHO: In My Humble Opinion Whether you are looking to power every appliance in your home or have a larger home with multiple large appliances, this 25,000 watt generator will keep you powered up through just about any time of power loss. 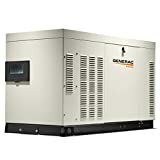 If you have a larger home that requires some serious wattage demands in the event of a blackout, you may want to look into the Generac RG07274ANAX 27,000 watt generator. With up to a 27,000 watt capability, this generator can easily power your whole small to medium sized homes and power just about all of the appliances in many larger homes as well. This single phase generator is liquid cooled and features and aluminum enclosure to give you years of use and Generac stands behind this with their 5 year limited warranty. The True Power Technology featured on this generator provides best in class power quality while delivering clean power that has less than 5% harmonic distortion. To preserve fuel, an automatic quiet-test run at a lower RPM. 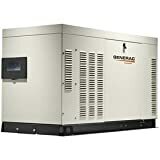 Generac offers a 5 year limited warranty on their RG02724ANAX 27,000 watt generator. IMHO: In My Humble Opinion If you are looking for a true full home standby generator, this generator could quite possibly be it. With 27,000 watts, most standard homes can go about their business like nothing happened in the event of a blackout. This generator has enough wattage to get just about anyone through any blackout. How Much Does It Cost To Install A Backup Generator For My Entire House? The cost of installation on a backup generator will depend on the size, type, and where you are located. You can expect to pay on average about $500 to $1,000 for installation of a backup generator. How Do I Estimate My Power Needs? A quick and easy way to determine how many watts you will need to power with your generator is to make a list of each appliance that you will want to power during a blackout. Check the ratings on each appliance to see how many running and starting watts each will require and add them up. I suggest getting the total and tacking on an extra 1,000 watts for any additional appliances you may add in the future. Choose your generator based on these wattage requirements to ensure you are covered for all of your appliances in a black out. Also see my calculator to estimate power needs. So there you have it, the top 10 best generators for whole house emergency backup power. I hope that this guide has allowed you to make an informed decision on purchasing the correct generator to keep your home powered up and how to safely use it. Are you currently running a backup generator on your home? If so, what size, and what appliances are you running with it? Please consider sharing this post with anyone you know who might be in the market for a backup home generator!